10. How often can sisters visit family/friends? How long? 11. Does any form of fraternal correction exist in the community? 12. Is there Daily Mass? If not, why? 13. Are there communion services held? How often? If the regular priest chaplain is unavailable does the community try to contact another priest to offer Mass or do sisters travel to a nearby parish? 14. Is the Sacrament of Confession frequently available? How often? 15. How many religious sisters are in the community? Postulants? Novices? Temporary Professed? Final Professed? 16. What is the average age of religious sisters? How many young women are in formation? Where do those in formation live? With professed sisters? Formation house? 17. When did the "youngest" member of the community enter? 18. Have any women left the community recently? How many? 19. Can women in formation have home visits? How long? 20. 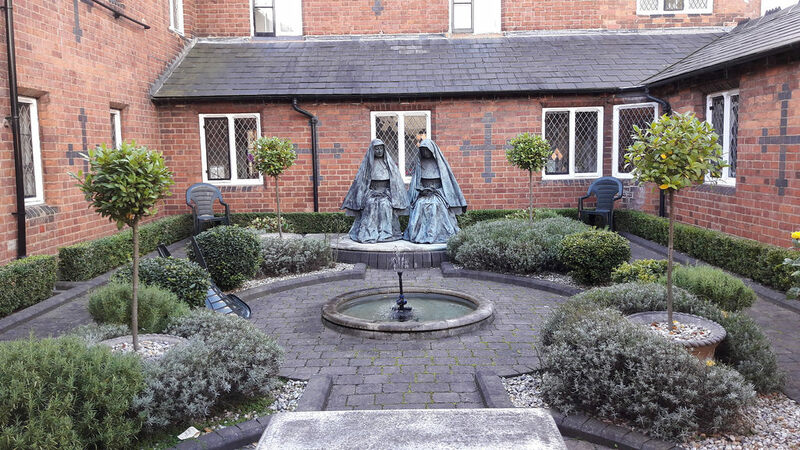 Can women in formation get visitors at the convent? How often? 21. How does your community feel about promoting vocations to the priesthood? How important? 22. What is your community doing to help promote vocations to the priesthood? 23. Is your community open to accepting someone with dietary restrictions? 24. Does your community accept women who are on medication? 25. Has a psychological exam always been a requirement to enter the community? 26. Are members of your community permitted to have a spiritual director? 27. How does the community practice the vow of poverty? 28. How does the community practice common sharing of property? 29. Is the community Diocesan or Pontifical? 30. How many meals does the community have together? 31. Do sisters take turns preparing meals? 32. Is there a cook? 32. Do sisters have house responsibilities, such as cleaning common areas? Is there a cleaning service? 33. What are the community's Lenten practices besides Ash Wednesday and Good Friday? Fasting? Penances? 34. Are sisters home together for the holidays or do they leave to be with their families/friends? 35. Do the sisters consider themselves to be a family? Do they prioritize one another? 36. How does the community practice humility? 37. How does the community follow the Rule of the community? 38. How does the community care for the elderly sisters? 39. What kinds of activities are available for elderly sisters who are retired from their ministries? 40. Is there an infirmary? If not, where do the aged and/or infirm sisters go? 41. Are sisters permitted to use the computer/Internet/tablet? How often? Can those who enter bring their technology with them? Do the sisters watch television? Listen to the radio? How often? 42. If sisters can have cell phones are they communal or are they personal cell phones? Limitations? 43. Can families/friends purchase items for individual sisters? If so, are items shared? Gift cards? 44. Do sisters receive a stipend? If so, how much? 45. How many cars does the community have? 46. How often does the community get brand new cars? Used cars? Donated cars? 47. Does the community have exercise equipment? Bicycles? 48. Does a woman who enters have too close her Facebook account? Before or after final vows? 49. Why does the community wear a habit? Not wear a habit? Always? Sometimes? 50. Is there an investiture ceremony to receive the habit? What is the symbolism behind the community's particular habit? Do sisters receive a new religious name? 51. Does a sister sow her own habit? Does the community provide her with the habit? 52. How long is each stage of formation? 53. If someone is asked to leave the community is she given a fair warning ahead of time? 55. Is there an entrance fee? If a woman leaves does she get any amount returned to her? 56. If a woman in formation needs to file taxes and receives a tax return does the community receive it? If so, if she leaves, will the community return it to her? 57. Does the community plan on relocating to another location in the near future? 58. Does the community plan on downsizing/expanding property in the near future? 59. Does the community plan to merge with another community in the near future? 60. What religious organizations is the community members of? Council Superior of Women Religious (CMSWR), Institute of Religious Life (IRL), Leadership Council of Women Religious (LCWR), National Religious Vocation Conference (NRVC), Religious Formation Conference (RFC)? Pax Christi? 61. Is the community a member of a Federation? Which one? 62. What is the Charism of your community? 63. What are the current community apostolates/ministries? 64. What are the vows that the community professes? How does the community live out their vows? 65. Does the community practice silence? Spirit of recollection? Grand silence? 66. How often are elections held to elect a new superior? New council members? Formation directors? Chapter? Corporation meetings? 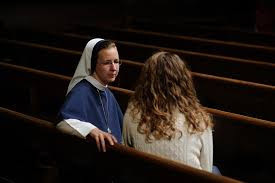 Are elections and meetings only for professed sisters or can those in formation attend, but not take part in the voting process? 67. Before a woman enters will she receive a list of the items to bring? 68. Do sisters wash their own clothes or is there communal washing of clothes? 69. What is the minimum and maximum age requirement to enter the community? Exceptions? Does the community accept formerly married women? Women with grown children? 70. Does the community pray the entire Divine Office together? Part of the Divine Office together? All year including the summer months? 71. Does the community provide toiletries? feminine products? 72. Do sisters have health insurance? Do those in formation receive health insurance? When does their coverage begin; postulant, novice, temporary professed? 73. Can a woman bring her own car once she enters the convent? If yes, when does she have to give it up? Novitiate? First or final vows? 74. If a woman plays an instrument can she bring it with her? 75. Does the community have a retreat house? Vacation home? 76. Do sisters have recreational activities outside of the convent together? Picnic? Ice cream? Hiking? Walking? etc. 77. Does the community have a relationship with the nearby parishes? 78. What does the community do for people in the local area? 79. Are sisters placed in their ministry or do sisters have to find their own ministry? 80. How do the ministries of the community relate to the wider Church community? 81. How do the sisters envision the future of religious life? 82. How do the sisters envision the community in ten years from now? twenty years from now? 83. How do the sisters envision the future of the Church? 84. How do the sisters envision the role of women in the Church in the future? 85. How do the sisters envision the role of the laity in the Church in the future? 86. If the community was to choose a new apostolate besides the ministries that are all ready in place what new ministries do you think the community would choose? 87. Does the community have any pets? 88. Does the community accept women into the community that are from other countries? 89. Does the community have any overseas missions? 90. If the community has overseas missions do sisters in the local religious community have to serve in the overseas missions? 91. Does the community accept international vocations? 92. If a woman joins the community what does she do with her money/property? 93. Does a woman who enters have to close her bank account, credit card accounts? When? 94. What is the level of education required to enter the community? 95. Does the community have any live-in experiences available to women in discernment? 95. Is a sister permitted to care for parents that are ill and/or of old age? 96. Do the sisters consider themselves to be "Brides of Christ"? 97. Do the sisters live together in community or separate in individual apartments? 98. If a woman is a recent convert how many years after becoming a Catholic does it take for her to be able to apply to the religious community? 99. What are the basic requirements to be accepted into the community? 100. How does a woman begin the process of joining the community? How long does this take?